Home > Blog > OETC’s Open House makes it into the news! 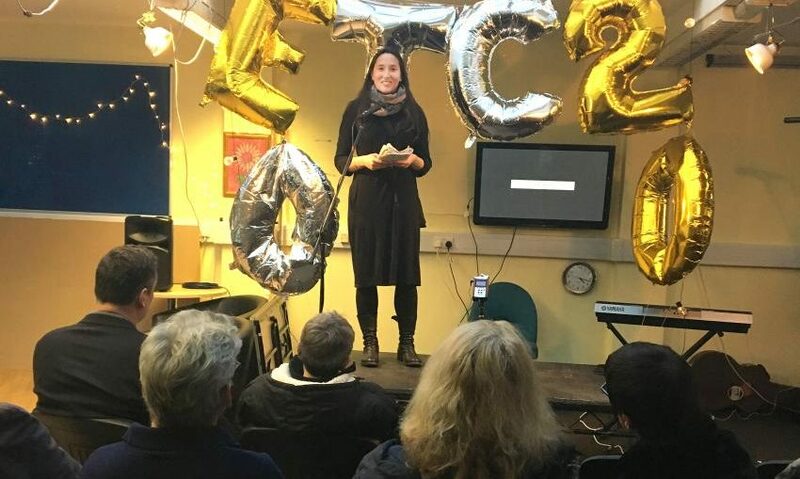 An open day to show Fulham residents what goes on at the UK’s only drama centre for substance misusers was a great success as several dozen visitors shared ideas, toured the building and watched performances. Rehearsed readings, stand-up acts, improvisations and recitations, compered by artistic director Matt Steinberg, were performed on the stage of the Outside Edge Theatre in Munster Road. The event, on Friday 2 November, gave past and present actors, residents, staff and patrons a chance to see the work that goes on behind the building’s anonymous facade. Brainstorming sessions were organised in two of the centre’s rehearsal rooms to explore new directions for the 20-year-old theatre group which numbers actor Mark Rylance and Led Zeppelin guitarist Jimmy Page among its patrons. “Addiction creeps up on you; you don’t realise until it’s too late,” said Penny – the mother of one of the Outside Edge service users, introducing a short play which looked at how the parents of a substance misuser coped with the support they were offered. With a question mark hanging over the future of the Munster Road building, Steinberg led an ideas workshop to plot future paths for the theatre, which enjoys support from Hammersmith & Fulham Council. “What’s vital is that we grow,” said Philip, one of the theatre group’s support workers. “Working with other addicts has kept me clean. Drama, as a system and a toolset, is why we’re here. One suggestion which emerged from the brainstorming session was the possibility of digitising the theatre’s workshops and events, to make them available to a worldwide audience. It was an idea which appealed to Steinberg. “We are the only drama company that works to change the lives of people affected by addiction, and we need to share that work,” he said. Outside Edge attracts former and current substance misusers from 26 different boroughs, although the majority are from west London. The cardinal rule is that the centre is an abstinence space, with no alcohol or drug use permitted on the day users attend. “This group is using drama to help substance misusers overcome their issues, and they perform a valuable service to those who are often overlooked,” said Cllr Sue Fennimore, Deputy Leader of H&F Council, who has helped arrange a six-month lease extension for Outside Edge while it weighs up future options. Anyone can attend drop-in drama sessions every Thursday, 6-8pm. The workshops are free, with no previous experience required. Outside Edge Theatre is located at 61 Munster Road, SW6 5RE, near Parsons Green tube station.